Yesterday I got a call from a friend with very typical problem. His DVD drive suddenly got a lot slower and refused to burn discs at speeds over 2x. This is usually caused by string of errors (from trying to read scratched disc for example) that makes Windows to drop drive into low performance mode. Quite easy to fix if you know what to look for. Programmed input/output (PIO) – this is legacy mode that makes heavy use of processor and has very limited transfer rates. No modern device should be used in this mode. Direct memory access (DMA) – much faster, in this mode drives can communicate with memory directly, bypassing processor. As described in this knowledge base article if Windows encounters string of errors it changes mode for that drive to slower and slower, all the way until it drops to PIO. Which results in massive loss of performance and high CPU usage on operation. First issue must be confirmed as such. 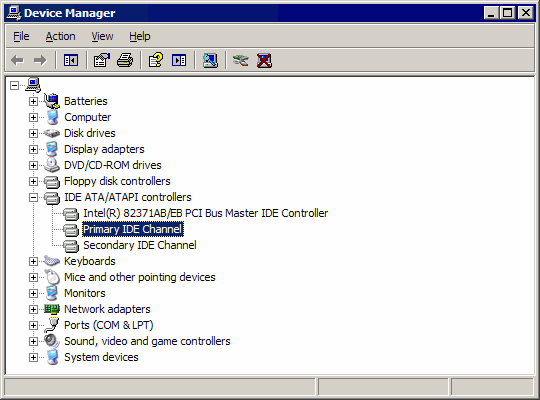 Locate in Device Manager (Win+Break) IDE channels and click through them. Advanced settings tab has details about current mode (Not Applicable means nothing attached to the channel). 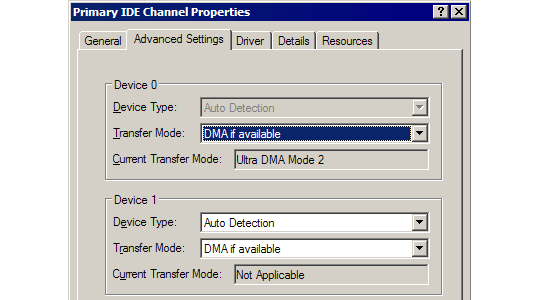 If any of drives had dropped to non-DMA mode then that channel must be reinstalled by Right-click > Uninstall in Device Manager and rebooting computer. It is best to locate (or download) motherboard drivers to have them ready if Windows asks for them after reboot. One of the more confusing issues when you first encounter it, mostly because Windows is completely silent about such enforced mode changes. Yeah, for hard drive it is usually bad sign. But for optical drives this is often triggered by petty reasons like crappy disc. In this last case it was triggered by mistakingly choosing too high speed for burning disc. This had happened to me quite a few times, right before my Optical drive died. I got so frustrated towards the end that I downloaded a small vbscript to automatically do this stuff for me. I have same problem with my DVD writer. After I get this error, I sold the DVD writer to friend & got new one (Both are Samsung). New one also have same problem. After few days it stop working. It is still within the warranty period. So I get new one. It also have same problem. Few month later I sold It to another friend & and get new LG DVD writer. It works fine for few month and brother gave it to someone else. Then he gave me a new Samsung DVD writer. Unfortunately it have a same problem like other Samsung DVD writers. (I think Samsung don’t support my motherboard). Thanks for sharing info. But it wont solve my problem yet. P.s. – I also have a ASUS DVD writer at my working place. It also have same problem. I foget to tell what method I use to solve this problem. 1. My motherboard has 4 SATA ports. 2. Usually 1st one for HD and second one for DVD. 3. after few DVD burns, It slow down as I said above. 4. Here is the trick, Turn off computer and open the cover. Then change DVD writer SATA port to next one. For me it is 3rd SATA port. After slow down with this port use next one. 5. Usually I check speed of my DVD drive with Nero speed check utility. When it says my drive is slow down below normal I do as said above. Thanks for your information. Its solve my problem. In my computer it is secondary IDE channel. I right click and uninstall it. Then I right click on main root icon and select scan for new hardware change. Now it is work fine. Glad it was of use. If you get this issue repeatedly with different drives you might have faulty cable that causes errors and transfer mode to degrade.